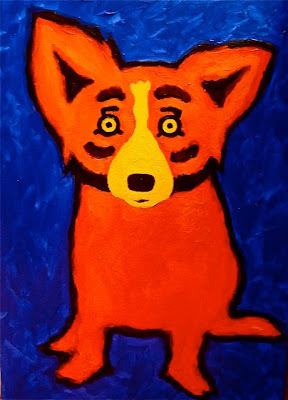 Early on the morning of October 31st I met George Rodrigue in the garage for the two-hour drive to Lafayette, Louisiana, where we were to meet some friends from California at the Blue Dog Café. I was running late. 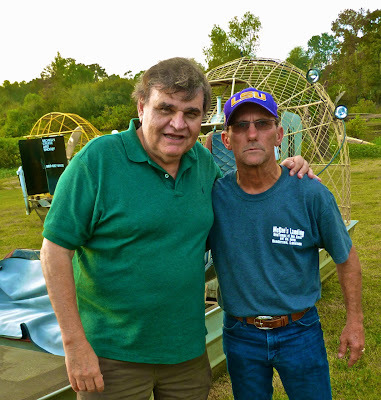 In Lafayette we joined our friends the Pistos and Ricciardis, visiting from Carmel in search of southwest Louisiana’s best boudin and pecan pie, as Chef John Pisto scouted locations for his television cooking show. 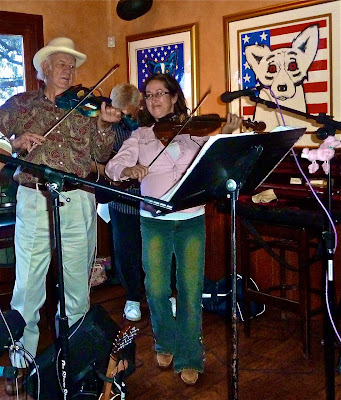 We enjoyed an excellent brunch at the Blue Dog Café, with the added bonus of Cajun Swamp fiddler Hadley Castille, who sat in with the Wildflowers Band (and who also happened to play at our wedding). 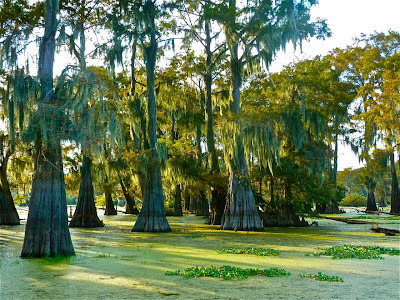 From Lafayette we drove through Breaux Bridge to the town of Henderson, where we crossed the levee to McGee’s Landing and the edge of the Atchafalaya Swamp. 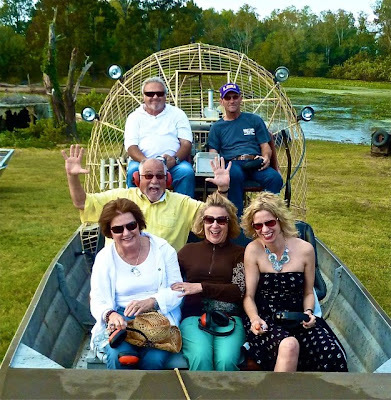 Now I’ve been on dozens of swamp tours in my life, all on pontoon-type, roomy tour boats. The closest I’d gotten to an airboat was reruns of Gentle Ben (1967-1969). “What’s an airboat?” asked our guests in chorus. “Has Captain David been drinking?” I asked George, under my breath. …as we donned our headphones and entered a silent movie. With one life preserver and no seat belts, it was just us, a bench, and the swamp. 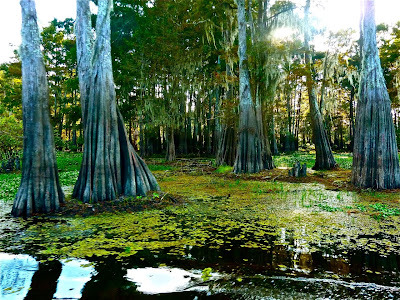 Captain David accelerated into the makeshift waterway for less than a minute before turning hard right into the lilies, the cypress knees, and the shallow black water. I thought of the magnificent things I’ve seen in my life --- our week-long rafting trip on the Colorado River; the birth of my nephews; the Basilica of Santa Croce in Florence --- and I recognized immediately such an event. I wondered at the azure blue dragonflies alighting on my shoulders, the alligators peering from among the lilies, and the herons and ducks and egrets reminding us of the shallow water as they walked near the boat. 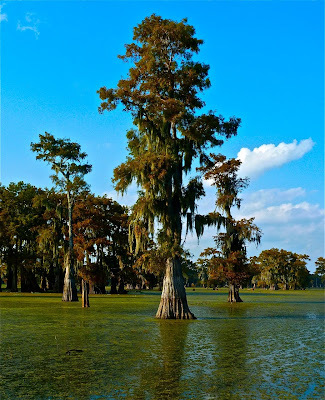 And I thought about the Cajuns, harvesting these cypress trees in the mid-18th and 19thcenturies, trees that grow slowly, struggling after all these years to once again fill the swamp. “In another century the trees will be back,” said George. With nothing but each other to hold onto, we raced (quietly praying that the animals get out of the way and the lilies are tougher than they look) through large areas of plant life, even flying over dry land on occasion, until we grew confident in our captain’s abilities. Yet as we headed full speed towards an eight-foot bank, I thought surely he was turning; and as we hit the mound of earth and flew straight up, I thought surely this wasn’t happening; and as we nose-dived towards the deeper black water on the other side, I thought surely (as I screamed at the top of my lungs for no one to hear) this was not the way I would die; and as the five-foot swamp tsunami barreled over the bow and into our laps and down (and up) my festive dress, I went into shock. The motor died, the women sat dripping in slime and disbelief, and the men sat bone-dry, doubled over with cramps of laughter. Collecting himself, Captain David approached us cautiously with his apologies and a single useless towel. 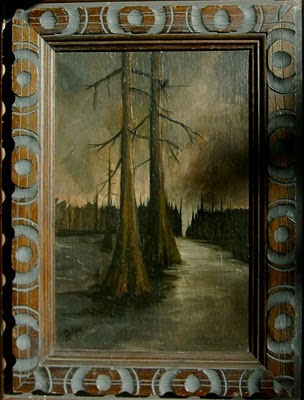 Dripping in green gradeaux,* we ladies wrung out our clothes and wiped our tears (of laughter or disbelief or some swamp disease or whatever) with the towel, while the men worried about the dead engine. I gave him the scariest look I could muster and then laughed some more, imagining us standing in the black swamp water fifty feet below the highway, waving down a passing motorist. "...on Halloween, covered in the monster mash," continued Cheryl. 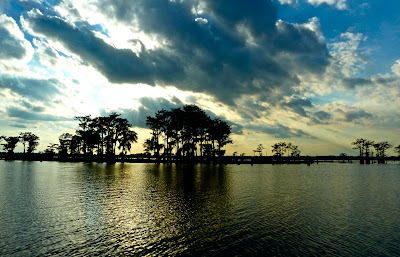 We refocused, however, as we watched the sun set over the Atchafalaya Swamp. 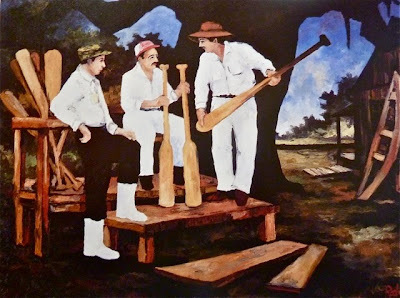 We could hear them, still laughing, as George told the story of him and Dickie in 1950s New Iberia, chased into the swamp by the sheriff after Dickie shot one of the Trajan brothers in the stomach with a pebble-loaded bb gun. Following the two hour drive home, I took the second longest and hottest shower of my life,* spending a good half hour afterwards cleaning the gradoux* off of the tiles. In my dry soft cotton pajamas, I crawled into bed where next to me I found, in place of my husband, a painting. “What’s this?” I called downstairs, where George watched the tail end of the Saints game. kind of reminds me of the time we went moss rock sliding in the Chattahoochee river, only to find out afterward, we were covered in leeches. and I do remember that shower afterwards for 30 years now. I loved this story but glad I was not a participant. You truly are a good sport and beautiful inspite of being covered by lots of gradoux. I wouldn't worry about cholera, but be on the look out for the amoebic dysentery. Y'all are good sports! So where is the best boudin and pecan pie? The only thing that would've made the story better is if a gator had flown into the boat. I fished in that swamp until I left La. in '74. It sure is a beautiful place and I have lots of memories. 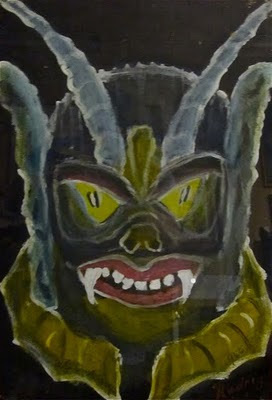 I remember GR bringing the Creature Painting to school one day! Now that some memeories, mae yea sha!!! Looking at the rings on does fingers and dat necklace, sha you wooda sunk ta da bottum!!!! Wendy, I don't think I've had such a good laugh in a long time! Thank you for sharing. You sucked me right into believing this was going to be some deep philosophical insight, and then WHAM! like an airboat hitting an embankment, you had me in fits of laughter. Great piece! 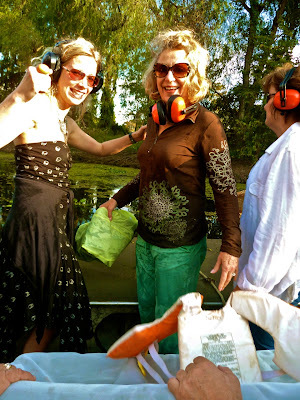 And seriously, a dress on a swamp tour?! Great story! I really enjoyed the laugh. Glad you are alright. LOL! 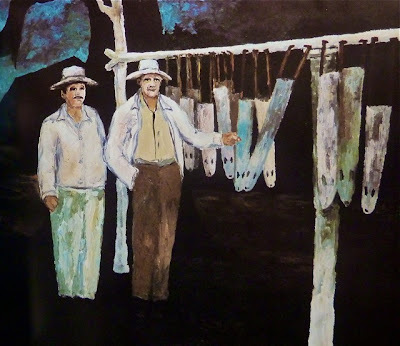 I've long been fascinated with the Cajun culture (which is how I came to be a huge Rodrigue/Blue Dog fan). 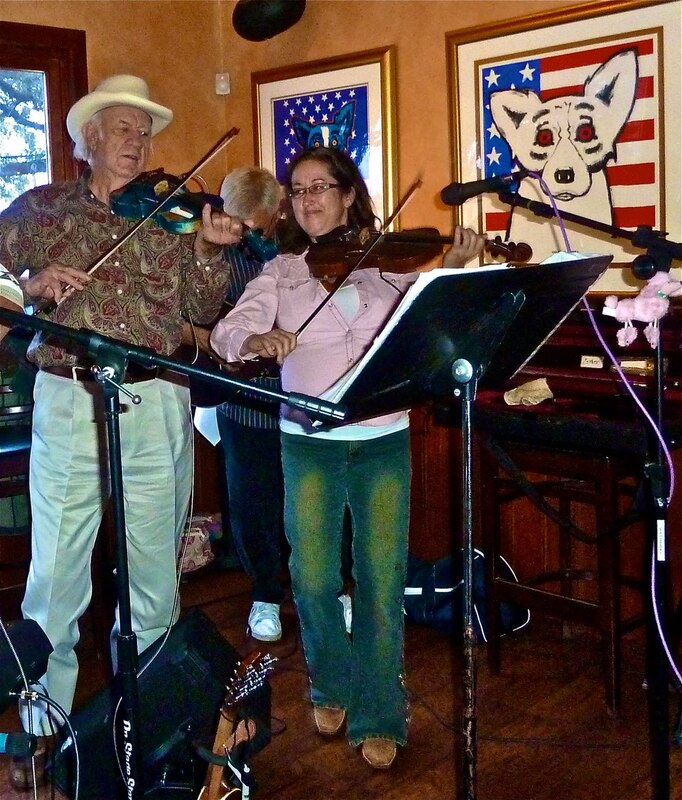 Years ago, my best friend and I took a trip from Tampa through to New Orleans and then onto Cajun country to Lafayette for the Festival Acadiens. 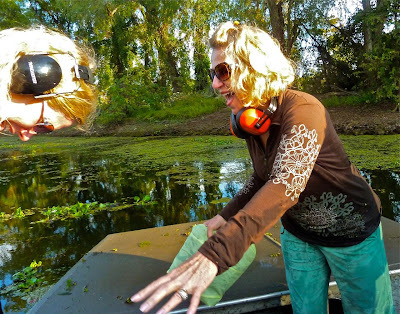 She made me promise her not to take a swamp trip exactly for the type of accident you described! I so much enjoy reading your musings! The Swamp Women one is the BEST! 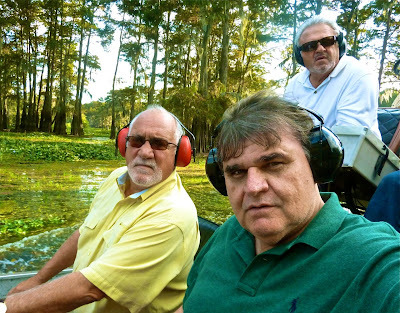 Bill and I and another couple went on a swamp tour in May of this year on Lake Martin. When I read your blog it brought back many memories! I have to say our outing was "tamer" than yours! We only got stuck once. Thankfully, all ended well for you guys! Keep writing! It's a joy to me, as I'm sure it is to many others. 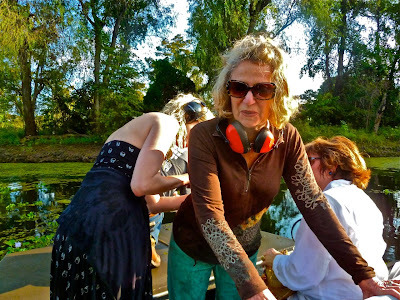 ...Are you sure Dr. Tony did not plant a incendiary device under the boat to kill the motor at the precise moment to propell the 3 women into the "witches brew"...? Wow, what a story! And a big YUCK. Don't get that slimy stuff on me! Those pix of the swamp were really fabulous. What a beautiful place - but much better to fly over than to get on yourself. I'm glad you all survived in one piece although a little worse for wear. Thank you Everyone! We're all STIll laughing about it! What a great story! Thanks for the laugh, it felt great. 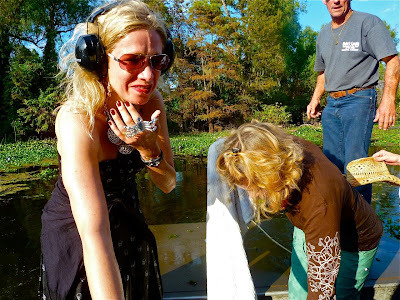 I've been on swamp tours, too, via McGee's, but nothing as heart-stopping (!!!) and hilarious (well, not at the time) as what y'all went through! I laughed so hard I could hardly see the words...you have brightened our day by penning this story of hilarity and beauty (the photos are amazing). Hi Richard - What wonderful stories! 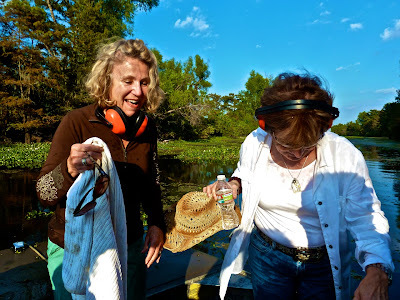 I tend to forget the uniqueness of south Louisiana, and then I tour the swamp with a group from California or am reminded of the challenges of explaining 'sucking the heads'! When you quoted Captain Dave saying "“Aw my Gawd,” said the Cajun, shaking his head. “Ladies, I am so sawry. In twenty years dat ain’t ne’er hap’nd.” It reminds me of the story my friend tells of her 70-ish year old father, very Cajun, relating to his family of the time he went to climb a ladder to pick grapefruit in their favorite tree! He said it like this "I went up 'da ladah, and sawt 'dat purdy red grapefruit...tried 'ta reach fur it and mah panses fall downt...aw mah Lawd, what would mah three sistahs thenk...here I stuck on da laddah, and I still want dat purdy red grapefruit..."
Thanks for sharing your adventure in the Basin, Wendy! Thanks...I still haven't stopped laughing, about our mutual "adventures" on boats...and I haven't even got to the story about my first trip on my father-in-law's boat, two weeks after eye-surgery, and how he got "stuck" on a sand-bar, and had to have the Coast Guard come rescue us....and I turn to my wife of a year, and ask, "Is *this* any sign of your father's "boating skills" to come?" She said, "just wait till you see how lost he can get just *getting* to the right road to get to the boat launch."